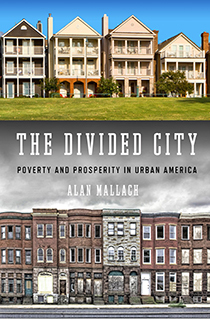 Alan Mallach, The Divided City: Poverty and Prosperity in Urban America (Island Books, 2018, 326 pages). Before you head out to the beach or mountains or wherever your summertime plans take you, grab a copy of Alan Mallach’s new “Divided City.” It’s a cogent analysis of the current state of play of the nation’s urban challenges and opportunities, and will give anyone who thinks about cities a wealth of new information, a powerful perspective on cities and neighborhood change, and some inspirational words that will guide you when you return to work. There’s some good news: Cities are coming back back. Mallach reminds us of the litany of urban obituaries written in the 1970s and 1980s: cities had become unlivable, their populations were doomed to unending decline, and would become reservations for the poor and the blacks surrounded by heavily guarded middle class suburbs. (page 26). Yet the narrative of urban decline from the 1970s and 1980s no longer holds; there’s a genuine renewal of urban life. The locus of urban economic prosperity has shifted from manufacturing prowess to knowledge creation and the quality of life. This shift, while it has worked to the advantage of cities, relative to rural reas, has systematically disadvantaged the industrial cities of the midwest, relative to coastal metropoli. The urban revitalization has been spearheaded by a generational change in attitudes toward urban living; young adults, especially well-educated ones are increasingly choosing to live in cities. The highly visible movement of young adults to cities–and the growth of emblematic businesses (bars, coffee shops, restaurants, boutiques), draws media attention to “gentrification”. There’s a fair amount of pearl clutching and hand-wringing among many self-styled progressives that gentrification is somehow making the plight of the poor even worse. Mallach critically examines this view, and shows why it’s a poor diagnosis and leads to even worse prescriptions when it comes to urban policy. As Mallach notes, gentrification is surprisingly rare, especially in these older cities. The growth that is occurring tends to be limited and centered near downtowns. This strongly makes the case that the obsession with gentrification obscures the big economic challenge facing cities and the poor. The big, un-reported trend that really explains the plight of the poor is occurring slowly and steadily outside the media spotlight–the steady growth of concentrated poverty. The poor are increasingly concentrated in neighborhoods where a high fraction of their neighbors are also poor. These neighborhoods are also disproportionately people of color. It’s understandable that gentrification is the flash-point of urban controversy. Gentrifying neighborhoods sharply juxtapose poverty and prosperity-which are usually widely separated in most metropolitan areas. But as Mallach’s careful analysis points out, it is the growth of concentrated poverty, not the exceptional instances of gentrification, that are truly behind the worsening plight of the poor. Mallach makes the case that too much money has been wasted on subsidizing stadiums, arenas, convention centers and the like. Nearly all of the benefit has been captured by the wealthy (and often absentee) owners of professional sports franchises, and the net economic effect of sports and related activities on regional economies is widely estimated to be close to nil. While heaping hundreds of millions of dollars on shiny projects, cities have generally short-changed the investments in human capital that would make the biggest difference for those living in poverty and in poor neighborhoods. Cleveland spent more than $600 million on three sporting facilities; by his calculation, a fraction of that amount invested in training and placement programs could have lifted thousands from poverty. There’s much, much more in this impressive book. Mallach touches on the accomplishments and limitations of community development corporations, on the spread of poverty to first-tier suburbs, the challenges confronting rural communities, and the now pivotal role that anchor institutions play in shaping development in many cities. There are compelling tales of how the process of neighborhood decline unfolds, step by step, with one small erosion of a communities assets triggering further losses. The book concludes with a chapter considering what policies might most make a difference to the future of cities. Mallach isn’t waiting or wishing for the federal government to ride to the rescue; while there are some things the federal government might do much better (notably assuring that housing subsidies were more universally available and targeted to low income households), success will depend heavily on local leaders who aggressively pursue building communities that work well for and are inclusive of everyone.